To understand what retinal detachment is it is first necessary to know the purpose of the retina. This is the fine sheet of nerve cells lining the back of the eye, and which is responsible for producing a picture of what we see and sending this picture along the optic nerve to the brain so we can 'see'. (It is similar to the development of a film so we can see pictures.) When retinal detachment occurs, fluid gets underneath the retina, usually because of a hole in it and 'peels' the cells off the back of the eye. This means the retina is unable to compose a clear picture and so vision is affected. Although it is a relatively uncommon problem, affecting around 1 in every 10,000 people, it appears to occur more frequently in middle aged people and those with short sight. It can occasionally happen in younger people, but the exact cause for a retina to detach remains unclear. 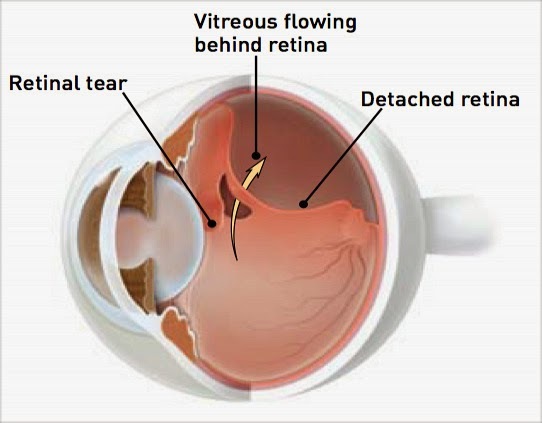 However, retinal detachments usually develop when a tear or hole develops in the retina. 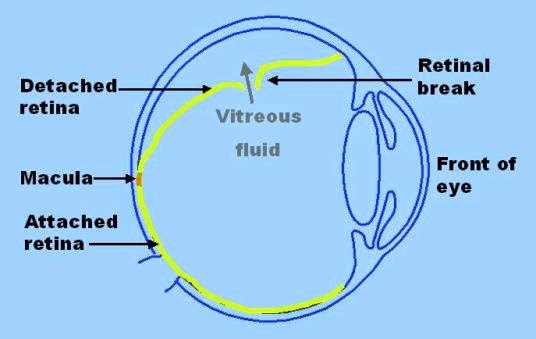 The hole allows fluid to seep under the retina and lift the retina off the eye wall. Other types of retinal detachments caused by scarring or inflammation can occur, but these are much less common. Contrary to popular belief, most retinal detachments are spontaneous and unrelated to injury to the eye. Patients with a family history of retinal problems, patients with abnormal thinning of the retina called lattice degeneration, patients who previously have had cataract surgery, or very nearsighted individuals are all at high risk for developing retinal detachment. Retinal detachment is an eye emergency and can lead to blindness if not corrected. The usual symptom is of a painless 'curtain' or 'shadow' spreading across the vision of one eye. This can be in any part of the vision, and may be a slow or quick process. As well as this curtain or shadow there can also be intermittent bright flashes of light, even when the eye is closed, or 'showers' of dark spots which seem to float across the surface of the eye. These are different from the normal 'floaters' we can all see from time to time, usually due to specks of dust on the surface of the eyeball. However, if these symptoms get worse, or your vision appears to be affected you should seek medical advice quickly, since the quicker treatment of retinal detachment is begun, the better the result. Your doctor will examine your eye with an instrument called an ophthalmoscope, and may organise you to be seen by an eye specialist (an ophthalmologist) that day. This may be in an out-patient clinic or via the emergency department of an eye hospital. The specialist will look at the retina in detail and be able to tell you if there is any detachment, where on the retina it is, and the best treatment for you. If the detachment is mild, simple laser treatment alone under a local anaesthetic is sometimes enough to repair it and prevent it getting worse. Most cases however will need an operation, usually under a general anaesthetic, and the choice of operation is usually the preference of the particular surgeon involved as there is no single type of retinal detachment operation. This may involve freezing the layers of the retina around the tear, or using materials such as silicone to 'push' the retina into place on the back of the eye. These do not usually cause any great pain, but the eye is often swollen afterwards for several days. If untreated, retinal detachment tends to steadily cause a loss of all vision in the affected eye. If the detachment involves only a small tear, or the lower part of the retina there is a small chance the vision may recover by itself. After surgery, recovery depends on how long the detachment has been in place for, and to what degree. 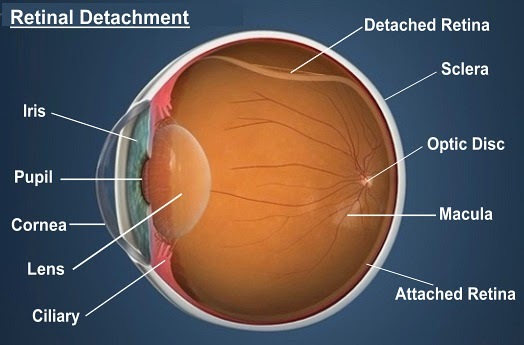 In all cases, the 'shadow' seen in retinal detachment will disappear when the retina is correctly replaced, but the greater the time the retina was detached the smaller the likelihood that accurate central vision will be restored although a general improvement in vision is usually noticed. It is virtually impossible to predict if retinal detachment will occur. If it has happened in one eye, regular eye checks should be done on the other one so any early signs can be spotted and treated. It never occurs as a result of heavy lifting or straining. 1. How long have you been noticing symptoms with your vision? 2. Are both eyes affected or just one? 3. Do you have any pain in your eyes? 4. Do you wear glasses for reading? 5. Does anyone in your family have a history of retinal detachment? 1. How quickly will I need treatment? 2. Am I able to return to work soon after any treatment? 3. Will I need to have any aids to help my eyesight or reading? 4. Do I need to go to a low vision clinic at my local hospital? 5. Are there any sports or activities I should avoid?